I forgot all about these two little sets!! These are made in Thorobred Soft for Tots (another sadly, discontinued yarn)and some variegated Panda Magnum ; these are ideal for using up small quantities of yarn. 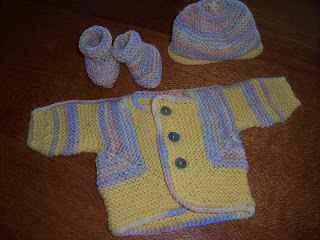 The little jackets use about 50 gram of yarn; the hats and booties even less! 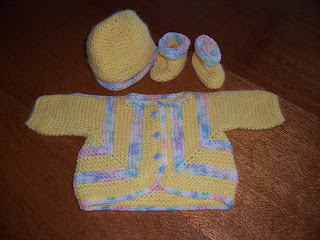 Did I mention that the jacket takes around three hours to knit?? And as I crochet them together (the only seam is from neckline to cuff) it is really a very quick project. Booties are Michelle's Preemie Bootie from Bev's Country Cottage - online. Hat is a basic baby bonnet, sewn from brim to crown to make a little round hat. I also made a baby blanket (feather and fan )and two more little baby sets - but I forgot to take pictures of them before I handed them over to Karen !! If I ask her nicely she might take pictures of them for me so I can post them here. What EZ pattern book has the Baby Surprise Jacket?